Darien running back John Reed (25) breaks free of a tackle from Middletown defender Dario Highsmith (6) to score the go-ahead touchdown in Darien's 13-7 win over Middletown in the CIAC Class L state semifinal football game at Pomperaug High School in Southbury, Conn. on Saturday, Dec. 7, 2013. SOUTHBURY -- Darien didn't put on an offensive clinic by any stretch of the imagination during its 13-7 Class L state semifinal clash with Middletown on a windy Saturday afternoon at Pomperaug High School. However, the Blue Wave attack got the ball moving when they needed to and watched their defense do the rest. With the win, top-seeded Darien punched its ticket to the Class L title game against archrival and No. 3 New Canaan, which picked up a 17-0 win over No. 7 North Haven on Saturday. Save for allowing a 72-yard touchdown run by Middletown quarterback Dario Highsmith with 5:50 remaining in the second quarter, the Darien defense left the door open for its offense to win the game late by shutting down the Blue Dragons and keeping the score at 7-0, despite Middletown starting several drives in good field position. "You watch Middletown tape and recognize that (Highsmith) carries the ball roughly three quarters of the time, and rightfully so," Darien coach Rob Trifone said. "We ended up having to play man-to-man coverage and packing the box. Our defense has been playing lights out the last four weeks. They did a great job against the Gatorade Player of the Year." Trailing 7-0 to open the second half, the Blue Wave (12-1) offense went three-and-out after three incomplete passes, and the Blue Dragons (11-2) drove into Darien territory, threatening to take what could have been a crucial two-score advantage. Middletown moved the ball from its own 14 to the Darien 38 on the strength of a 10-yard carry by Highsmith and a 28-yard run by Jacob Homar. Instead, the Darien defense forced a turnover on downs, snuffing out a promising drive. 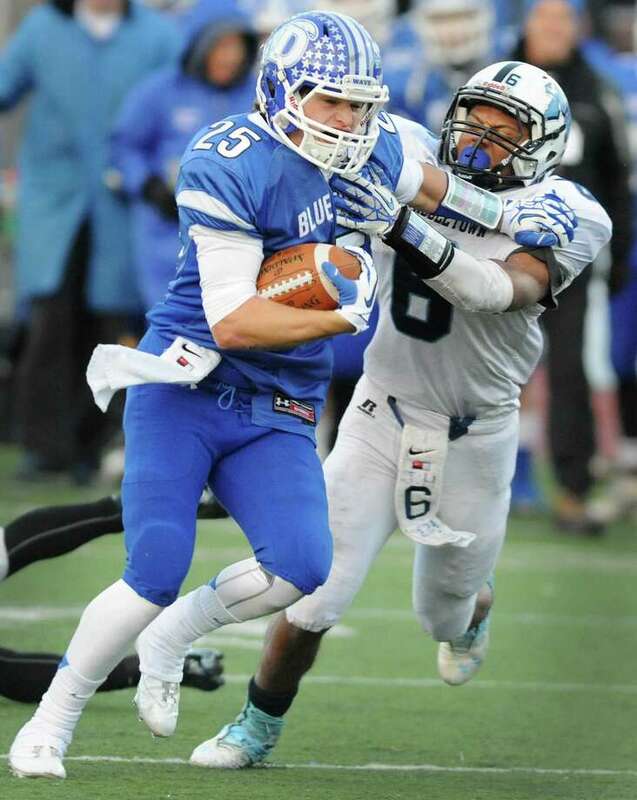 Darien's ensuing possession ended in a punt, but Daly Hebert pinned Middletown on its own 10. After a three-and-out by the Blue Dragons, the Blue Wave got the ball in prime field position at the Middletown 29. A 19-yard catch and run by Griffin Ross advanced the ball to the Middletown 8, but the Blue Wave faced a third-and-goal from the 11 two plays later. Needing a touchdown to tie, Silas Wyper threw to his left to hit a wide open Jay Harrison on a swing pass, and the senior fullback went untouched for the score, knotting the game at 7-7. "It's not easy coming from behind against a great team," Trifone said. "It takes a lot of character to come back." Following a Middletown three-and-out and a short punt on its next possession, Darien needed just one play to dial up the game-winning touchdown, as Wyper faked a handoff and threw quickly over the middle to John Reed, who did the rest by bouncing off a pair of Middletown defenders and diving inside the left pylon a 37-yard touchdown reception with 10:52 remaining. The extra point was blocked and the score remained 13-7. "That quick slant pass was working all game and I just beat my guy off the line, was able to get the pass and saw the end zone and got to it," Reed said. "We came back and we were able to put up some points." Highsmith was a one-man show on Middletown's next possession, carrying 11 times for 38 yards on a 14-play, 56-yard drive that ultimately produced no points, as the Blue Dragons turned it over on downs following a pair of incomplete passes from the Darien 18 with 2:26 remaining. Middletown earned one more possession by using all of its timeouts while forcing a Darien three-and-out, but with just 1:55 remaining, the Blue Dragons needed to go to their little-used passing attack. "We practice (the two-minute drill) every week, and I thought our kids were well-prepared for it. We actually made some plays, got out of bounds. We were heads up," Middletown coach Sal Morello said. "The scheme didn't surprise us. We had trouble pushing those five defensive linemen. Those are big kids." Highsmith completed a pair of passes for 14 yards and added a 21-yard scramble to move to within striking distance, but his desperation fourth-and-10 heave from the 33-yard line to the Darien end zone was broken up by Will Hamernick. "Unfortunately, we're getting used to (close games), but at least we're coming out on top," Reed said. "(The championship) is going to be fun. We got the best of (New Canaan) last time so we're excited for it. It's going to be a good game."